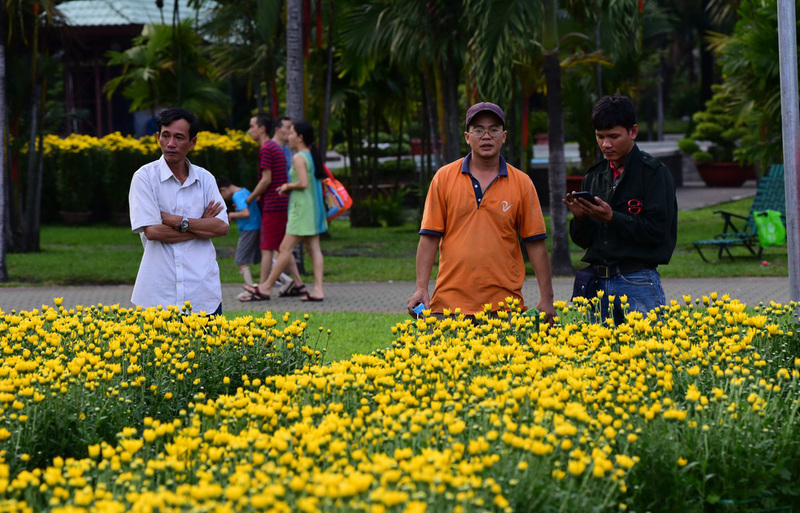 A large number of flowers and fruit trees to be used as home decorations during the Lunar New Year (Tet) celebrations have begun arriving in Ho Chi Minh City under a week before the start of Vietnam’s longest public holiday. Vietnamese people customarily decorate their homes with flowers and other plants believed to bring them good fortune during the first days of every new lunar year. These days farmers are transporting plants they have grown for multiple months to Ho Chi Minh City – one of the largest markets in southern Vietnam – from their hometowns in Mekong Delta provinces such as Dong Thap and Ben Tre. Boats carrying such plants dock along riverine Ben Binh Dong Road in the southern metropolis’ District 8, as they do when the occasion draws near every year. This year’s Tet begins on February 2. Other makeshift marketplaces include public parks and sidewalks. Plants on sale range from chrysanthemum varieties, kumquats and pomelo trees to Vietnamese apricots with yellow blossoms, or hoa mai – the symbol of Tet in southern Vietnam. A pot of flowers fetches VND50,000-250,000 ($2.2-10.8) while a pot of a pomelo tree costs over VND10 million ($430).